My Father recently sent me a random page he found on the ‘net that amalgamated all the footprints I’ve left on the ‘net for the last 13 years. Scrolling through the pages was a bit like going through an old closet – there were some bad choices made, some tacky things said and some dubious colorful commentary. Overall though, I wasn’t displeased by the pages and pages of references (some going back to 1998!). Generally, they showed a positive, forward-thinking businesswoman who sometimes spoke with too much candor but had a clear purpose in life. When I started Bramble Berry as a naive 20 year old, I never envisioned where the internet was going. I didn’t realize that there would be hundreds and thousands of online communities started and then shuttered with their archives alive for everyone and anyone to see. I didn’t think of my words being like handwriting on a fogged up window, disappearing until someone came along and blew. My entire life is out there on the internet just waiting to be excavated. Now, I’m lucky. I’m self-employed and (knock on wood) hope to continue in this fashion for the rest of my life. I don’t have potential employers scouring the internet to find my one or two indiscretions. I’m happily married; I don’t have possible suitors checking me out online before a first date. But, what I do have is potential customers searching about my company, making a value judgment on if they want to do business with us. Every little thing you say, on every arcane forum or every forgotten blog or every long-lost site, is out there, ripe for the reading for anyone with a little bit of time on their hands and a basic grasp of the Way Back Machine. What are you saying right now? Are you leaving trails that you can be proud of? Are you living your life offline and online with integrity and commitment to your values? Are the words you’re writing today something that you would be proud of your kids reading in 20 years? Yes, be honest. Be authentic. But, always be mindful of your reputation because every track you leave online is building the foundation for your reputation. I did a Google search recently on my proper name, and thankfully, nothing bad came up. However, I did another search, using my email account name and there’s someone else who’s using that account name in other formats. Hopefully if anyone looks me up using my username, they’ll be able to differentiate between me and the other person. As the old saying goes, if you have nothing good to say, say nothing at all. This is such an important post. It’s something they should teach in school (primary and secondary, and dare I say, college and university…). Many people think the internet is anonymous (it is for some) but forget there’s a real person at the other end. I’ve been there, on both sides (sadly). So true Anne-Marie. Great article. I think we forget sometimes how powerful the internet really is. Things do not just go away because we hit the delete button. I will definitely be more mindful of what I put out there. And stay away from the computer in a heated moment, lol. So true. Who knew these things would be searchable, or that anyone might care to look! Great post! This is such an important thing to be aware of that so many people aren’t. socialmention.com is one site you can make such a search. Search your name/business/web url. This just happened to be the topic over dinner the other night with our 15 year old son. He did not realize that all of “this” was here forever. When we painted the picture, he got it. Now the likes on Facebook have slowed down and he thinks more before he types. SUCH a good point. Thanks! That’s a great reminder article AM! I’m curious though, can you post the site that has this info? Can we all see where we’ve been before too? I appreciate that you wrote this. Your words carry alot of authority. In the whole 2 years I have “known” you, Anne-Marie, I have NEVER seen an indiscretion. This speaks well of your upbringing, your leadership, and most of all, it begets your uncontested continuance of the title of reigning Soap Queen. We all go through SO MANY things in our lives, our careers, and our womanhood. But in all things we are called to speak graciously, wisely, and with just a dash of salt. I, am (slowly) learning to remain positive and as a leader I try to keep the comments at a higher level than what I witness around me. I purpose to inspire, encourage and cheer on those who do the same. Last week I really REALLY had to hold my tongue as I wanted to write an acrid post. It took all the self control that I possessed but I feel that we need to be able to look back and be proud of our integrity online. With fingers flying, it is so easy to write something and then regret. Honestly, maybe we should journal when emotions are high; keep it and then burn it later. Hold onto it overnight; then look at what you have written before posting. Does it make you feel proud of who you are? If not, hit delete. Thank you for sharing. XO! It’s nice to know Brambleberry is a real person Anne-Marie not just a boring office somewhere but a real person who cares about her customers and who is glad to be alive. It is evident that people want to do business with a great person like you because you are bright, wonderful and you share yourself in everything you do and everything you sell. That makes things real…real good…I am always glad to do business with you, so thanks for caring! Yes, Anne you are right. 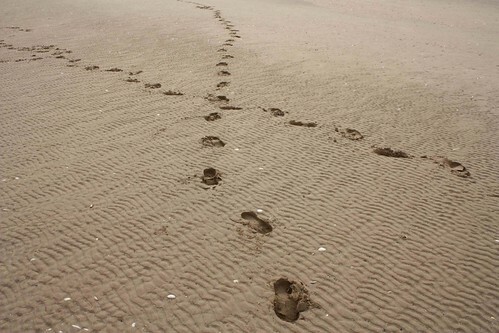 Our footprints will be always there. In my case, my little girl have already said to me: I want to make soaps for the rest of my life mami, like you!!! And my husband also loves to get involve at the time to make soap and make new projects. It is a little family business, and we have a lot of fun at the same time. Thank for posting this thoughtful message, it is great to have you and your knowledge in your web, blog, and videos!! I enjoy them a lot!!! Being honest is our goal!!! I hope they understand my sense of humor in the year 2050! Great post Anne-Marie, I try to be as honest yet mindful of every word that I say or type. I think everything you say and do comes back to haunt you, whether good or bad. Thanks for such a wonderful reminder about how what one does online will follow you offline…FOREVER! I’ve always said “If you don’t want your Mom, Grandmom, spouse, kids or boss to know about it, DON’T put it on the internet, in any way, any form, in any fashion. Sadly, it seems that even people who should know better, don’t. And then get upset or mad when it bites them. When they start whining and crying, I always ask “And just WHAT did you expect? wow something to think about for sure!